The American cocker spaniel can be a delight or a medical and behavioral nightmare. The delightful cocker loves children and is very friendly, gentle, playful, and trainable. Unfortunately, due to careless breeding, many American cockers are aggressive, nippy, intolerant of children, and difficult to train. If you want an American cocker, begin obedience classes and socialization with adults, children, and other animals early. The cocker does well in the city, suburbs, or country. The cocker's coat is silky and flat or slightly wavy and may be black, any other solid color, black and tan, or particolor. The ears, chest, abdomen, and legs are well feathered, the ears lobe-shaped and long. 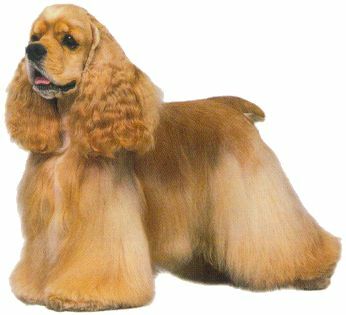 The cocker should be brushed and combed two to three times a week and trimmed every two to three months. The ears should be cleaned weekly, and the ear flaps, which tend to end up in the food bowl, need to be wiped off daily. This dog needs brisk walks and playtime every day. 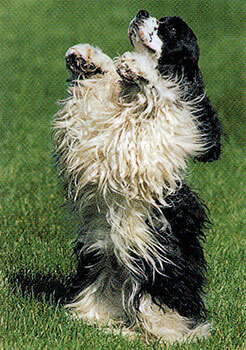 The American cocker spaniel is descended from the English "cocking" spaniels that were used to flush woodcocks from their hiding places in the 19th century. For more information please read The History of Cocker Spaniels. It is especially important to obtain a cocker spaniel from a reputable breeder; indiscriminate breeding has resulted in dogs with some serious problems. Do not buy one from a pet store. Breed-related health concerns: deafness, skin problems, hypothyroidism, autoimmune disease, eye and ear problems, patellar luxation, urinary tract problems. If you want an American cocker, begin obedience classes and socialization with adults, children, and other animals early.